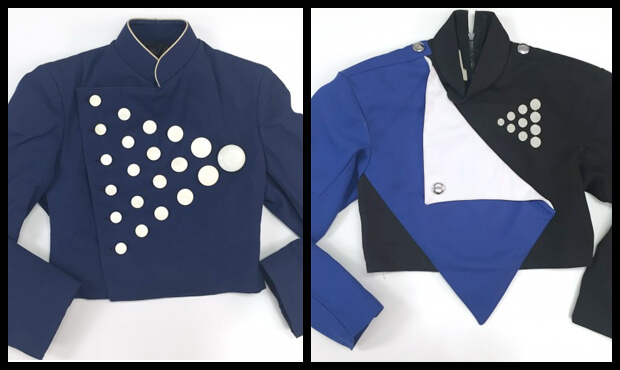 Some of the classic uniform looks of the Blue Knights are now up for sale. • Jersey Surf "shares the love" with a star of HBO's "True Blood"
The Academy posted a video recapping the corps' experiences performing as part of Super Bowl XLIX earlier this month in Arizona. Registration is now open for the Blue Devils' series of System Blue summer camps for students. Select events include a new educational track for band directors. As part of the corps' "Legacy Sale," you can buy Blue Knights uniform jackets from the 1980s, 1990s and 2000s, in addition to member/staff T-shirts from those eras as well. Check out the corps' online store to see all available items. Blue Stars pay tribute to the corps' co-founder Dr. David Kampschroer who passed away on Monday at the age of 74. The Bluecoats report that they are almost a third of the way to their goal of raising $20,000 to purchase a sleeper coach vehicle that will transport volunteer crews during the corps' summer tour. Tickets to the Boston Crusaders' 75th anniversary gala celebration are now on sale. Packages come with tickets to the DCI Summer Tour event taking place at Gillette Stadium in Foxboro, Massachusetts, access to a special VIP after-party, and more. The Cadets are now accepting nominations for the corps' 2015 class of Hall of Fame members. Check out a gallery of photos posted from Carolina Crown's rehearsal camp that took place over Valentine's Weekend. What's it like to march as a member of the Cascades? Watch this video to find out. Crossmen introduces fans to the new drum major who will lead the corps through its 2015 summer season. Actor and musician Janina Gavankar, known for her roles on "The League" and HBO's "True Blood," paid a visit to Jersey Surf's rehearsal camp last weekend in New Jersey. Gavankar is working with the corps on several new projects. Madison Scouts alum, Charlie Gumbert, was selected for induction into the Winter Guard International Hall of Fame. Catch up on news from the Mandarins in the corps' latest installment of its video newsletter. Music City posted a gallery of photos from the corps' well-attended rehearsal camp last weekend in Franklin, Tennessee. Phantom Regiment mourns the loss of Dr. David Kampschroer, who passed away this week. Kampschroer, who is an inaugural member of the DCI Hall of Fame, stepped in as interim director of the Regiment in 1999 during a time of organizational and financial instability for the corps. New photos have been posted from the Raiders' rehearsal camp last weekend in Burlington, New Jersey. The February edition of Spirit of Atlanta's "Delta Newsletter" is posted online. Don't miss this video snippet of Troopers members performing a section from their 2015 production, "Wild Horses."